Wow! The pleasure boat industry certainly has started rebounding. Since last year, a number of Monaros have changed hands; a new 298 is under construction, our staff has increased, and work is progressing on the new Monaro 235 model. As work load was slowing down in the fall, surprise, we received an order for a new Monaro 298. This order came from an existing Monaro 27 owner who simply wanted a new Monaro but bigger, and optimized based on his 27 and other boating experience. There will be lots of new and exciting features going into this super deluxe 298. On the 298 exterior you will notice the new elliptical port lights including one for the first time in the aft cabin. The biggest changes are found on the interior. Beside the very latest electronic technology (using the NMEA2000 standard), the dash has been modified to accommodate two large touch screens plus Volvo digital display, and auto pilot control. The boat will be powered with a powerful single Volvo D6-400 diesel. It will be quick! Also, we are going green with two large solar panels on the hard top, and using Lithium ion AGM batteries. To allow for extended trips off the grid, we’ve also created some new interior molds and a larger fuel tank. Watch for this boat in Northern BC waters this summer. 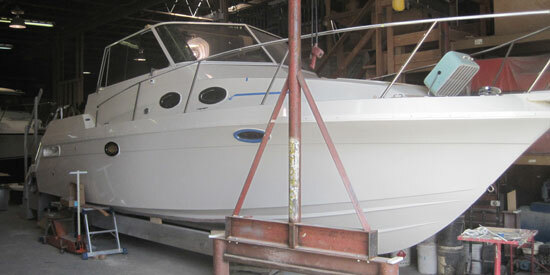 We’re also anticipating for this new Monaro 298 to be in the Vancouver International Boat Show next January. Since last summer, to the very best of my knowledge, two 298s, five 27s, four 24s, and two 21s have found proud new owners. One of the 298s is headed to Anchorage, Alaska soon. Preowned Monaros are certainly in high demand this year, especially the larger ones. With the 21 – 255s, it’s with galleys and/or outboard power. The demand is exceeding our supply. Now we just need that demand to turn into more new sales. Some of these new owners asked us do fairly extensive alterations and upgrades to suit their needs. Of the many jobs done, one was to install a 9.9 Yamaha with autopilot on a 27. Many years ago we did an early version that proved unreliable, but this one works well. Electronic upgrades continue to be the most popular changes requested, plus hull and swim grid extensions. Our new 235 has been progressing slowly. Due to the many other projects plus a shortage of staff. It’s very hard today to find suitable workers that understand boat construction, but we have been fortunate lately in finding some good people to work with our long time employees. There are a number of potential buyers for the 235 staying in touch and watching progress. With some of the larger projects nearly completed, we will be able to focus more and pick up the pace on this exciting new model. Earlier this year we acquired a 3-axis CNC router table. For those who are unfamiliar with this tool, it is a router cutter that is controlled by a computer. It can take a drawing of an object and cut it out with precision, both in two dimensions and three. Our table is 5x10 feet with a 2” vertical capacity. We already have the skills of computer aided drafting. This was just the logical next step. This machine will be used to produce parts from digital drawings which will eliminate the need for our existing wood patterns. The big task ahead is to create digital drawings of hundreds of our existing patterns. 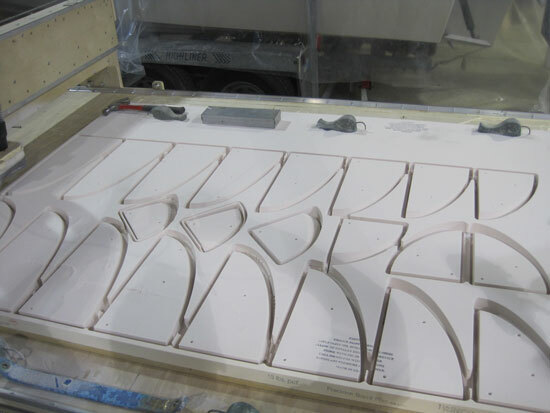 We will also be able to create more complex molds more efficiently. 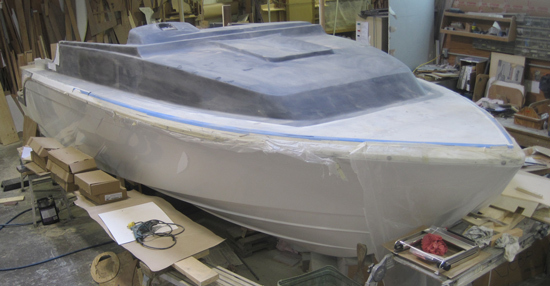 We plan on using the machine to help in the tooling of the new 235 and production of the boat. 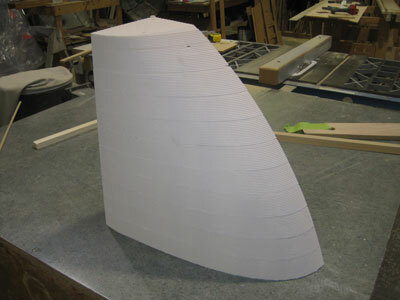 We are not limited to 2” vertical with our 3D structures as we can stack pieces together.